this is a great analogy. I like it very much. You should teach this to students whenever possible. it’s helpful for design management. thanks michael. Nice. 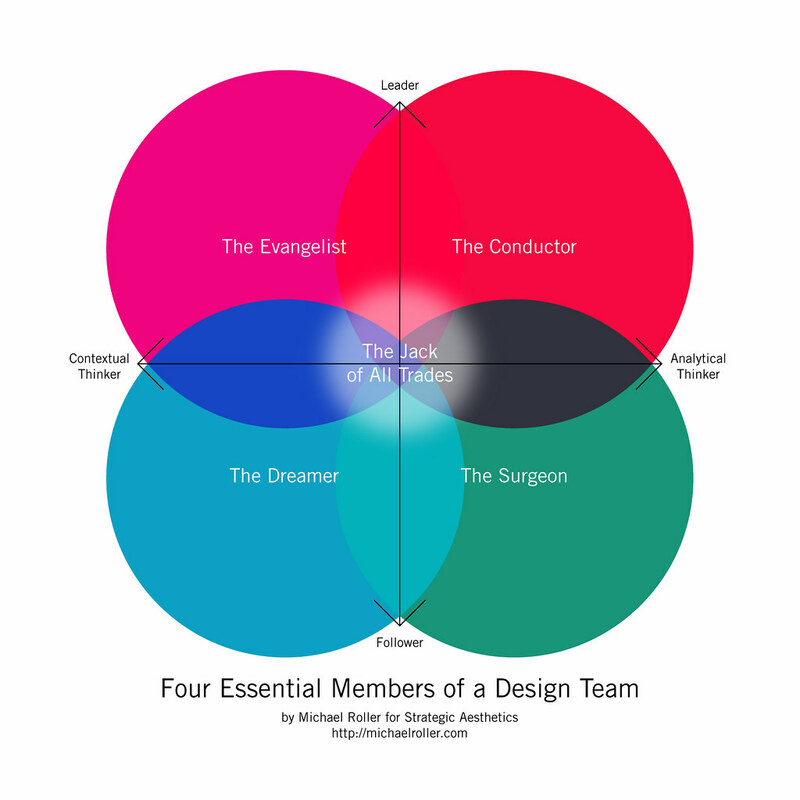 Similar to IDEO’s structure/team recommends. You should also look at Von Manstein’s Officer types for managing teams. He was a German general and, basically, he hypothesized that the smart and lazy people made the best commanders and innovators because they stay focused on the big picture, and are used to finding novel solutions to get around drab work. Thanks, Tim. I checked out a little on von Manstein’s officer types here and here. I had some amazing minutes reading this, thank you! What I could not understand is why you refered to the Contextual thinkers as men and the Analytical thinkers as women. Really great! I had to do a little blog post about it:) Looking forward to your follow up articles. thanks for this great article. I definitely find myself in the dreamer category. But sometimes I feel like I’m put in the role of “Jack of all trades” here at work. And I want to move away from that because I want to focus on what I love, and that is design. I really liked the way you defined kinds of designers. It could also be considered that these clasifications are more roles rather then personalities…. sometimes designer has to change a particular role depending on the stage of design! I will look forward to see more on this from you. Thanks. Absolutely. For instance, our VP of Design needs to act as both Evangelist and Conductor, depending on the occasion. I’m sure everyone feels this pressure to perform multiple roles, which is normal and even ideal. I really like the description of a team, I think it’s true. I just don’t understand why you just have a “male” description. I’m not radical feminist or anything, I’m freelance Industrial Designer and I consider myself the Evangelist of the team, so I don’t understand why you wouldn’t just write “them” or “she or/and him”. @Melissa – two of the descriptions are about hypothetical men (“he”) and two are written about hypothetical women (“she”). I agree that it’s important to acknowledge both genders as a part of design teams, and I thought this was the most appropriate way to do so. Of course, any member of the team could be male or female.